If there was ever a town that could understand what the Pirates are going through, it's Cleveland, Ohio. As they struggle right now to maintain any shred of self-respect they have left to try and woo LeBron James, their city was probably a little bit distracted from a weekend series featuring two teams with a combined record of 51-86. As for the Pirates, they'll take wins however they can get them these days, and the Indians completely played down to their expectations by losing two of three against a Pittsburgh team in the midst of a painful 12-game losing streak. Hey, no one ever said being a Cleveland fan was easy. We all know how tough last week was for the Pirate organization, a span of several days that has been very well-documented. At last we left them, the losing streak was intact and a pierogi racer was being fired for Facebook comments, so we'll pick things up on Saturday night. The well-hyped pregame featured the emotional reunion of the 1960 World Series Pirates team, with everyone from Maz to 91-year-old former GM Joe L. Brown in the house. The Pirates are 4-0 at home this season when playing before crowds of 30,000 or more, and the reunion attracted 38,008 strong. You can see the writing on the wall, or in this case the writing on the blog, because the Pirates ended their dozen games of futility with a 6-4 win over the Tribe on Saturday night. Lastings Milledge led the charge with four RBI, and Andrew McCutchen reached base five times and scored four runs. 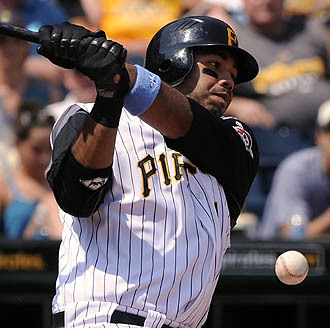 Pedro Alvarez drove in a key run with his first career hit, a double, in the fifth inning, the run that would ultimately decide the game. It was the Pirates' first win in interleague play this season. On Sunday, the Bucs took their second straight with a 5-3 win over Cleveland, as Alvarez once again contributed with the go-ahead RBI in the 8th and Brad Lincoln had his best outing yet, allowing three runs over six innings. It wasn't good enough for his first MLB win, but hopefully that's going to come in just a matter of time. The name of the game yesterday was fundamentals, otherwise known as the things you're supposed to be doing. The Pirates shouldn't be praised for being able to execute sacrifice bunts or not swinging at pitches outside the strike zone, but those skills appeared to be lost to some degree this season. On Sunday, they made a healthy resurgence, with four sac bunts and three of the game's four walks against a tight strike zone from home plate ump Paul Emmel. Individually, the Pirates only mustered eight singles at the plate, but it was the timeliness that allowed them to push five runs across despite the lack of any extra-base hits. Bobby Crosby led the way with three and Garrett Jones had two, growing his hit streak to 11 games. Even John Russell got into the act with a rare show of emotion, enough to get ejected in the eighth while taking on the whole umpiring crew over a controversial Russell Branyan double. It was his first ejection this season and fourth as the Bucs' skipper, one that was a pleasant surprise to the Pirate fans in attendance. I hope the Pirates kept some of those good vibes for a lengthy road trip that starts on Tuesday night against the piping-hot Texas Rangers, a team that's been rejuvenated under the leadership of Nolan Ryan. Tommy Hunter (2.08, 2-0) takes on Mr. Wonderful (0-5, 5.22) in Arlington at 8:05 tomorrow night. The trip includes three games against Texas, a rare visit for three games at Oakland, and wraps up with three games against the Cubs at Wrigley. PNC Park won't see the Pirates again until July 1, when the Phillies come to town. What will be most interesting is the state of mind that the team will bring back with them after the first lengthy MLB road trip for many of these youngsters, especially with three tough games in sweltering Texas heat to start things off. I have REALLY been down on Milledge, but he certainly has upped his play since being put back into the lineup and he deserves a pat on the back. A lot of guys would have just gone through the motions and given up. It's sad that the Pirates doing the things major leaguers should on a pitch to pitch basis is cause for celebration, but we'll take it when we can get it. Lincoln did a nice job overall yesterday and the defense certainly helped, which has been a rarity. Ok, I like that Milledge is playing well, but my problem with the outfield is that there's no bigtime power guy. Cutch can send a few out on occasion, Milledge is improving at the plate, but can't send one out of the yard to save his life, and Tabata's not much of a power hitter either. Don't we need at least one outfielder capable of hitting dongs on a regular basis? Our starting pitching blows BTW. I actually like the kind of 'smallball' outfield they're putting together. Speed doesn't go into slumps, but with a quick singles hitting team, you need to do more little things right (bunting, baserunning fundamentals, etc...). Besides, Tabata's mini Manny, right? So he'll be blastin moon shots before we know it, right? Guys? ... right? @LLimHB - As for the hitting of "dongs". That sounds dirty to me... can we PC it up a bit & refer to them "dingers"? Let's see how many starters we have tomorrow night @ TEX (including a DH) that are batting below .240. What's the over/under? 3? 5? Maybe we should DH Hot Rod Lincoln? All of the OFs profile to be 10-20 homer guys as they develop, so I'm not worried about that yet. Milledge has hit for power before, he's just been zapped of some of it by his bad wrists. He's still hitting a lot of doubles, so I'm not worried about him. He just needs to get on base.